Sorry, but there will not be a new post this Monday, as I’m on vacation. Rago Auctions, Lambertville, NJ, held an Early 20th C. Design sale on September 22, 2018. Included in the 428-lot sale were a selection of ceramics by George Ohr, the Martin Brothers, Newcomb College and Rookwood. The makers of the glass selection were R. Lalique, Emile Gallé, Daum Nancy and Tiffany Studios, among others. The top lot of the sale was a large, 16¾”, Martin Brothers bird tobacco jar. It sold for its low estimate of $112,500, including buyer’s premium. The market has shifted in the last couple of years to the best examples, which are still doing well. In my opinion, this example wasn’t particularly special, but it was big. 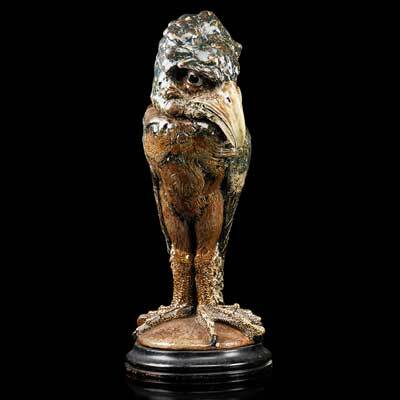 The other Martin bird in the sale, lot #328, sold within its estimate of $20,000 – $30,000, realizing $26,250, including buyer’s premium. 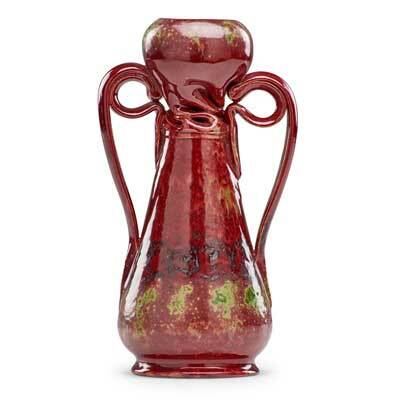 A wonderful, colorful, 7¾” George Ohr vase with handles and a twist brought the third highest price of the sale. It realized $56,250, including buyer’s premium, against a pre-sale estimate of $37,500 – $42,500. 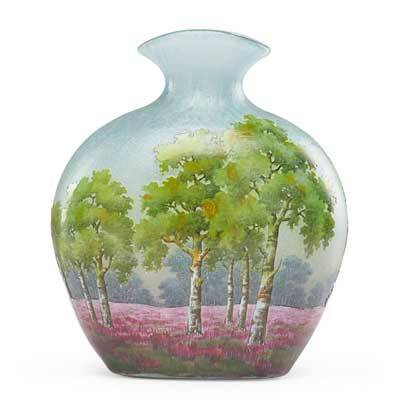 Lot #408 was a lovely Daum Nancy scenic vase. It sold above its high estimate of $2,000, realizing $5,625, including buyer’s premium. I was the underbidder. Upon later reflection, I should have bid more. It was beautiful and rare. 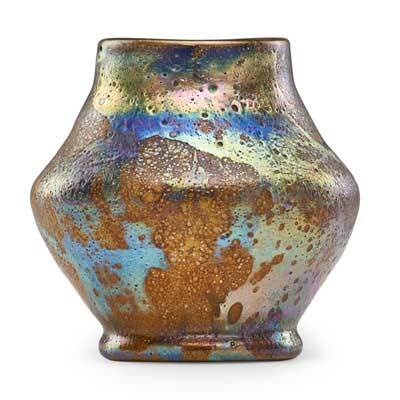 The selection of objects by Tiffany Studios was weak, except for lot #418, a Tiffany Favrile Cypriote vase, with provenance from Minna Rosenblatt. It sold for $10,625, including buyer’s premium, against a pre-sale estimate of $4,000 – $6,000. This entry was posted in Auctions and tagged chasenantiques.com, Daum, French cameo glass, George Ohr, R. Lalique, Rago Auctions, Tiffany, Tiffany Favrile, Tiffany Studios by Philip Chasen. Bookmark the permalink.